Hello, friends! In November I took part in a Secret Santa Swap organized by the Hero Arts Flickr Group. For the swap each person sent a hand-made Christmas card, a Christmas ATC and a gift to the person we were playing Secret Santa to. This is my SS package for Heather. It was a double challenge. First, I have never made an ATC (Artist's Trading Card) before. Second, I needed to make a card for an outstanding cardmaker and not fall on my face. 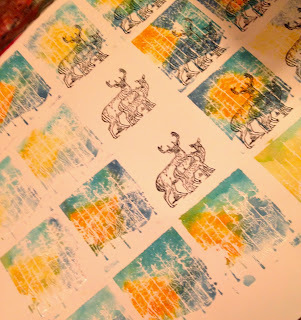 If you visit her blog Stamping and Stitching you will see what I mean. 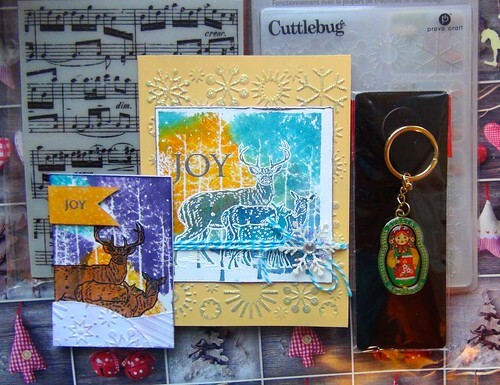 Looking for a smaller sentiment to fit the tiny size of the ATC, I discovered I already have two sentiments "Joy" in one stamp set but in different scale (Holiday Sayings by Hero Arts). This fit the bill perfectly! I stamped Tiny Star Background with water on the sentiment flag. Here's a peek into the process. I took a large piece of watercolor paper and tested various colors, color combos, inks, embossing on top of watercolor backgrounds (Winter Trees by Hero Arts). I used perfect pearls mixed with water and distress inks to color the dear family (Winter diary by Scrapberry's). For the background I also tried first and second generations of stamping. So I had lots of options for my card and the pieces which did not turn out I could use later on for grid cards.